Slitter services - Junise Plastique Inc. In order to handle the increased demand for laminated and specialized materials, JUNISE Plastics Inc. has purchased new equipment expanding our in-house capability for contract slitting and can now offer custom slitting and rewinding services for narrow and specialty webs. Our business has recently shifted towards structures that require advanced slitting capabilities, and the introduction of our state-of-the-art DEACRO slitter meets both our speed requirements and provides us with the flexibility that our customers need, allowing us to slit to precise specifications quickly and efficiently. The slitting and rewinding process is a very important one in the converting industry; with almost every product requiring some form of this process during its inception. Customers demand quality, trouble-free rolls so that their printing, forming and packaging machinery can run at maximum speeds with minimum downtime. A successful slitting and rewinding operation must produce a wrinkle free finished roll with a uniform firmness and a precise width. The DEACRO-C24 is the most popular centre winder in North America. The machine has many unique Automatic features, which include Knife Setting, Core Positioning, Reel Removal and Packaging. The C24 has the ability to convert rolls from width as narrow as 1» to as wide as 62» from master rolls up to 63» wide. We can use 3» or 6» cores, and our finished rolls can have a maximum 24» OD. We use a range of knife systems including Razor, Sheer, and Score knives. These allow us to slit a variety of polyethylene & polypropylene films and structures, both printed and non-printed. 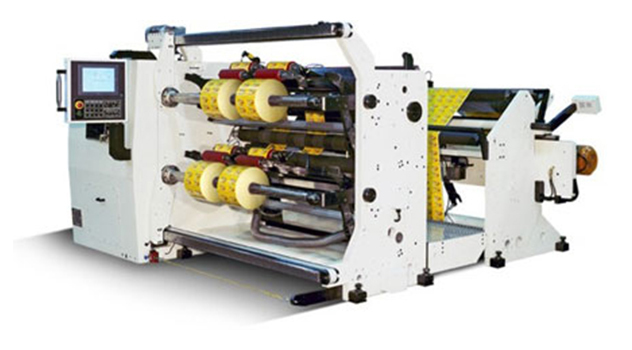 The slitter is capable of speeds from 300 to 1500 ft/min, and with a turret rewind and an automatic roll management system, it is ideal for large volume runs. Our slitter is equipped with static bars to eliminate static, and a trim removal system for more precise results. Also, the C24 is ideal for folding/converting poly sheeting into U-film. – OD: Up to 40’’ O.D. – OD: Up to 24’’ O.D. – Down to +/- 0.0002». We provide contract slitting and rewinding to both end-users and other converters and manufacturers who do not purchase our films or use our other services (printing & converting). Throughout the industry, companies and competitors alike can come to JUNISE Plastics Inc. when they have something difficult to slit, sensitive to wind or require fast turnaround on new materials for a rush project or product. Together we will establish a process customized to match your own production and delivery processes. Please contact us if you would like to speak with someone about our slitting services.